It's user group time and I am hitting the road! This month I have agreed to speak to 5 IBM i user groups in a seven day swing that will start in Seattle and then take me across the heart of the midwest. It starts Thursday, March 10th at lunch in Seattle (a place I have spoken a lot, as you can imagine) at the Pacific Midrange Systems Association, and ends at a dinner engagement on St Patrick's day in Chicago at the OMNI user group. In between, I'll stop in Toledo Ohio then move on to Michigan, visiting user groups in Southfield, Lansing, and Kalamazoo. To see a complete list of cities and times, follow this link. The flag ship presentation on this tour is a new creation called "Automated Encryption with V7R1." As you can imagine, we're pretty excited about the new automated encryption capability that IBM has put in DB2/400. Townsend Security customers who use our AES/400 encryption solution will be able to select sensitive fields in their databases and turn on encryption with just a menu option. Townsend Security's AES/400 encryption then works with DB2/400 to automatically encrypt, and (based on rules you can specify) automatically decrypt data on your IBM i. 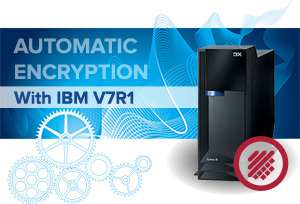 If you have been contemplating encryption on the IBM i, your encryption project just got a whole lot easier. So if you're in the neighborhood of any of these user groups, be sure to stop by and say hello. We love to meet and talk with our customers and learn how they are using our software. Do you belong to a user group in another part of the country? Drop us a line to see these presentations at your next meeting. Patrick or myself would enjoy coming out to your group and showing you how cool automated encryption is.